This sign in Sprowston Road, Forest Hill has survived only in part. Happily, Sebastien of Painted Signs & Mosaics has done an excellent job of decoding it as advertising P & P Campbell, Perth Dye Works. Further searches for other examples of the company's adverts suggests that they favoured plain text, so there are no missing logos or illustrations here. The company had a network of agents throughout Britain in the nineteenth century, offering both dyeing and dry-cleaning. Unfortunately it was hit by domestic problems and competition from German dyes in the early twentieth century, and the final straw was a major fire in 1919. P&P Campbell were bought by Pullar's soon afterwards - which suggest that this is a very old sign indeed. We should be grateful that so much of it has survived, as well as disappointed that the central section has not. 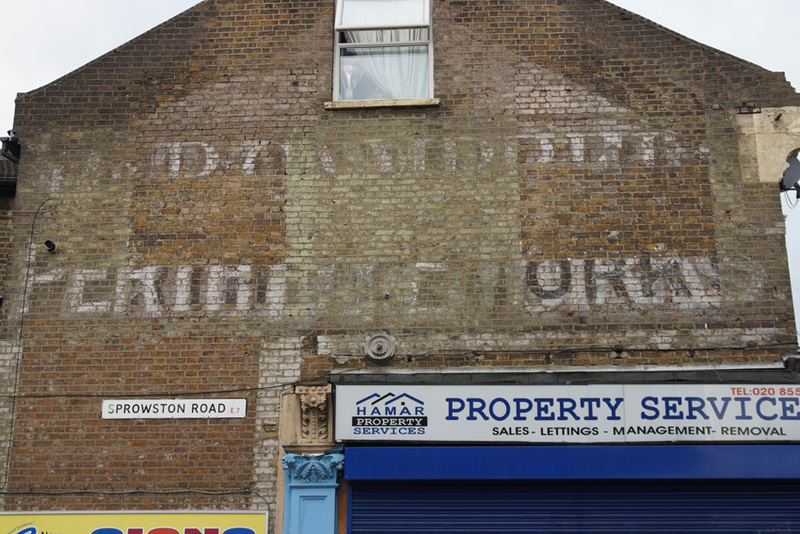 It occurs to me to wonder whether there is a registry of "ghost signs" (or whatever their official designation is). The reason for that thought is that we make a fuss about old factories and shops, rightly regarding them as part of our heritage and vital elements in the study of industrial archaeology but do not pay so much attention to ghost signs though these too provide evidence of past commercial and industrial activity. In some instances, they also provide evidence on the age of the building to which they are attached and any changes in the layout of the area (e.g. if the sign is no longer easily visible, then something has changed in the environment). I wonder whether there is a scheme for listing ghost signs as there is for listing and therefore protecting buildings of historic interest. If not, should there be one? The ghost signs archive is documenting them, partly as a way of preserving them, but the only one I know of with some protection is the Hovis sign in Camden Passage. By the way, thank you for helping inspire post (72)!